The Twin Tower effect is when two topping tails appear in an index or a stock chart. This often tells us that the index or stock is about to decline. Where does this Twin Tower come from? Well, we just have to look at two skyscrapers across two continents to help us visualize the power of this combination. If anyone has been to Malaysia, a small South East Asian country north of Singapore, you would have certainly gone to the most famous landmark in the country. It is none other than the Petronas Twin Towers. Completed near 1997, the Petronas Twin Towers were a symbol of pride for the nation. However, the towers marked the beginning of an economic collapse for the country. The rationale is very simple, when a country is becoming more prosperous, the nation begins to think of building a tower that is taller than any other. Nearing completion, the country begins to run out of money because of overspending. This is normal in human nature and will continue to occur again and again. This is known as the Skyscraper Effect and you can read about it at Investopedia's article about the Skyscraper Effect. Another very interesting article you should read is Look How Skyscrapers Have Predicted Recession Through History from Business Insider. The Twin Towers in New York is also a symbol of a quick crash for many traders in America. When the planes smashed into the towers, the towers came tumbling down. When the market reopened, it crashed. So, the Twin Tower effect really represents a crash in an index or a stock. Therefore, when you see two topping tails in your stock's chart, you need to be very careful because your stock may come crashing down. 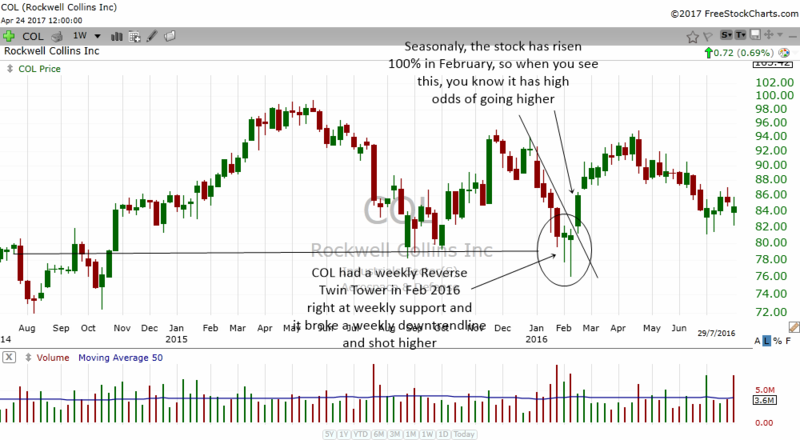 I'm sure most of you who trade stocks would know what a topping tail or shooting star candlestick pattern represents. These two patterns are the same pattern with different names because different traders call it by different names. The effect of a topping tail or shooting star is that buyers were not able to move the stock higher and the stock closed near the opening price. This tells us that sellers were in control and therefore the stock is likely to decline the next day. The logic behind the Twin Tower Effect is that if one topping tail is bearish, the presence of two topping tails is even more bearish. 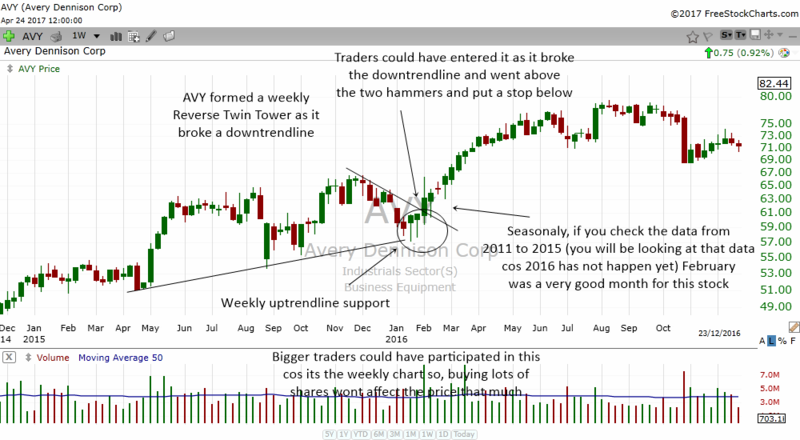 The Twin Tower Effect in a lower time frame is actually a double top. The beauty of technical concepts is that what works in one direction also works in the other direction. For example a double top may have a double bottom. Or a head and shoulders top can have the opposite which we call a reverse head and shoulders pattern. In the same way, the Twin Tower can have a Reverse Twin Tower. What this means is that two bottoming tails can often give us a potent signal that a stock is bottoming. In a lower time frame, the two bottoming tails are actually double bottoms. As you can see from the stock charts above, the Twin Tower Effect and the Reverse Twin Tower Effect is extremely powerful. 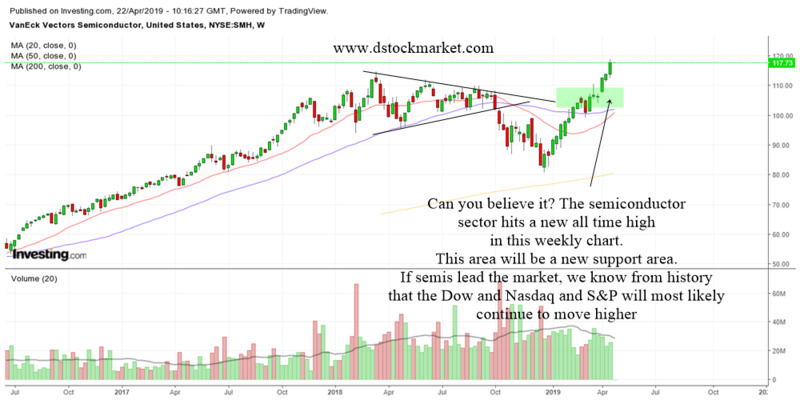 The pattern may be rare but when it appears, they can be very powerful in helping us to spot quick reversals to the upside. The beauty of it is that they appear in all time frames. 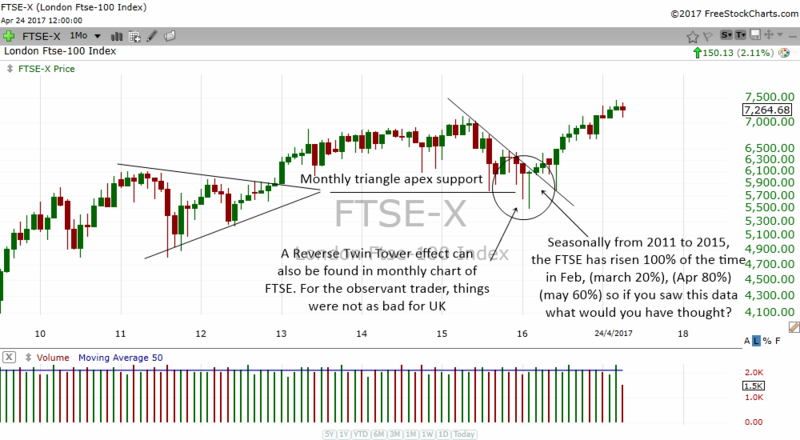 When you combine these patterns with seasonality charts, they can be very powerful in helping us to spot reversal areas. To learn more about seasonality charts, take some time to read How To Use Seasonality Charts To Time The Market. Seasonality is very powerful and certain indexes and stock follow certain patterns during different times of the year. 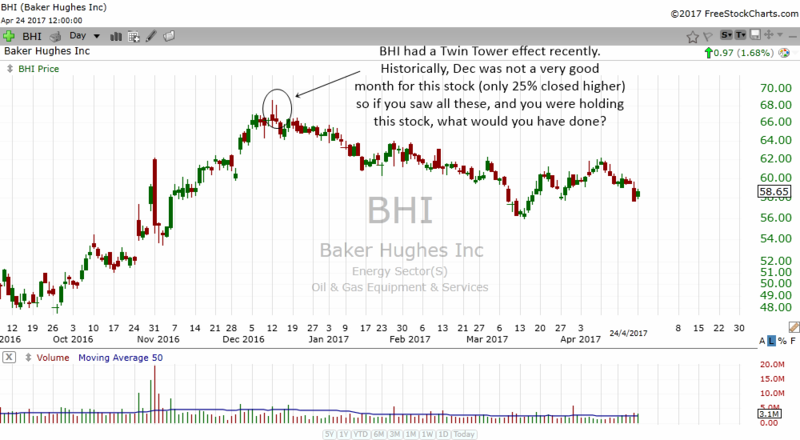 Since the time of this writing, there has been many twin tower effects that have formed in many stocks. It's just that we probably did not notice them because they might be foreign stocks or they happen in a time frame that we did not see. Recently the SnP500 index formed a twin tower effect in the 60 min charts. The index was chugging steadily higher and then it formed a twin tower effect in the 60 min chart. The next bar after the pattern formed was a big red bearish bar. It was a warning sign. Then the index moved sideways for awhile and slowly formed 60 min triangle and when it broke below the 60 min triangle and a 60 min uptrendline, the index collapsed in just a few hours. The big collapse was just the first wave of selling. You can see from the chart above how the index dropped all the way down 2 times the initial drop. That is why we must always respect the twin tower effect when it forms in an index. If it forms in a stock, only the stock will drop or at most the sector that it influences. But when an index forms a twin tower effect, we better start to pay attention and look for any sign of weaknesses.